On behalf of Eddlesborough Golf Club, the club captain Mr Peter Wardle presented a cheque for £7887.30p to Relay For Life Aylesbury after picking Cancer Research UK as one of their chosen charities to receive money raised at the club’s annual charity golf day and auction. 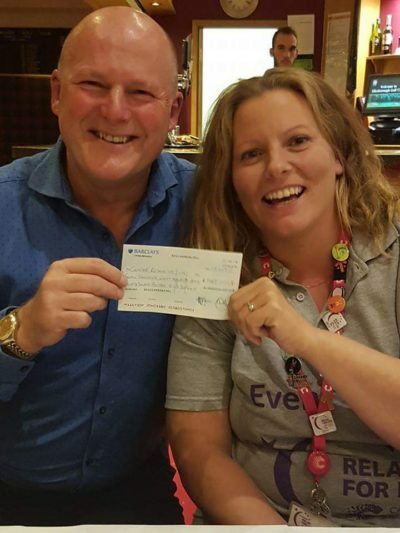 Event Chair Paula Kirby and Vice Chair Makyla Devlin attended their presentation dinner to receive the cheque and thank the club members for their generous donation to start Relay For Life Aylesbury 2018 fundraising. Paula went on to say that this was a great start to the 10th Anniversary year of Relay for Life Aylesbury fundraising.